Hospitality has always been a main character trait of Kazakh people. Even if you have just a minute to pop in to a Kazakh house, an owner will still ask you to sit down and offer a fragrant tea with sweets. Respectful attitude to the guests contributed to the fact that traditional Kazakh feast took a shape of a ceremony, noninferior, in its philosophical and allegorical content, to world famous Chinese tea ceremony. Hospitable owner would offer his guest a seat at a place of honor. Traditionally, meal is served at a low round table, called dastarkhan. First and foremost, in order to quench thirst of the guest a hostess would treat him with a bowl of yogurt drink. This can be "kumys" - a drink based on fermented mare's milk - or shubat the main ingredient of which is camel milk. Then, table will be filled with baursaks - balls of dough, pre-fried in boiling oil (Asian analogue of donuts), samsa - triangular pastries with meat, kausyrma - a kind of thin pastries or fried doughs filled with meat and onions, raisins, kurt (small, salted cheese balls) and, of course, tea. Here, to be objective, we should say that tea never grew on the territory of Kazakhstan, it was introduced to the Steppe of Kazakhstan from the outside, but despite this, tea quickly gained popularity among the local population. And today, in fact, it is one of the main drinks in Kazakh society. After a long-drawn tea ceremony, assortment of dishes on the festive table will be complemented by meat dishes: kazi, shuzhuk, zhal, zhaya, karta, kabyrga. The above dishes are traditionally prepared from horse meat or lamb. The main dish of Kazakh cuisine, with which owners welcome their guests is besbarmak. Name of this dish is translated from Kazakh as “five fingers” because of a manner to eat the dish by hand. Besbarmak's main ingredients are: meat (lamb or horse meat), pasta (it is cut into small squares), as well as herbs (dill , parsley, cilantro, etc.). The procedure of cutting meat cooked for besbarmak is a separate special ritual. Typically, this mission is laid on the owner or a highly respected guest. According to traditions, each part of meat has its own meaning and is served in a special way. Thus, meat from the pelvic bone and tibia is given to senior honored guests. Son or daughter-law gets pruning from a sternum. Cervical vertebra is usually served for unmarried girls. Sheep's head is cooked in a special way and is served separately. The right to cut this element of besbarmak is usually given to a guest of the highest rank. According to the European classification, all these dishes belong to a group of second dishes and snacks. As for traditional Kazakh first course, sorpa – rich broth completed by seasoned vegetables, spices and herbs - occupies a special place. Sorpa, unlike other first courses, is for drinking, so it is served in bowls. Tea ceremony completes the meal. - Main ingredients in traditional Kazakh cuisine are meat, flour and milk products, though nowadays many other ingredients are common in the cuisine. - Kazakhs are believed to be among the top countries in tea consumption, almost every meal is followed by tea in Kazakh families. - Kazakh cuisine is usually not spicy. 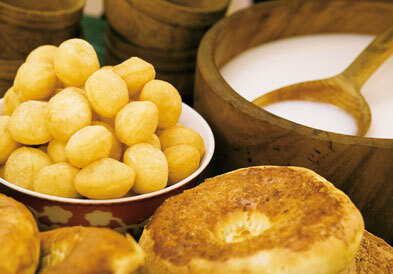 - There are many high calorie dishes in the traditional Kazakh cuisine.